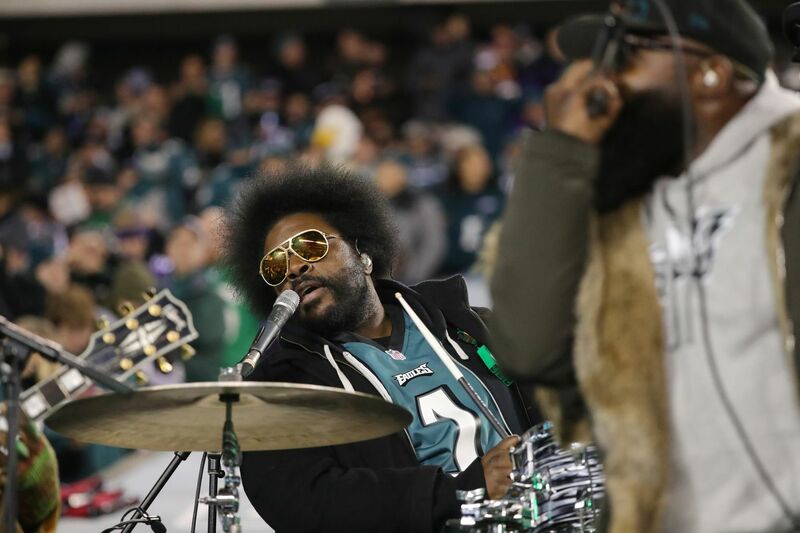 Questlove from the Roots performs during half time of the NFC Championship game between the Philadelphia Eagles and the Minnesota Vikings, Sunday, Jan. 21, 2018, in Philadelphia. Questlove has weighed in on the Kenney administration's reported decision to move Jay-Z's annual Made in America festival off the Benjamin Franklin Parkway. Questlove, real name Ahmir Thompson, addressed the situation via a statement on Instagram in which he drew parallels to to the Roots being dropped from Wawa Welcome America's lineup in 2016. Previously, the Roots music-directed Wawa Welcome America, which is also held on the Parkway, every year from 2009 to 2015. >> READ MORE: Made in America is moving off the Ben Franklin Parkway in 2019. Is it leaving Philadelphia for good? "So what's the logic when someone cuts its nose to spite its face?" he wrote. "For all Philadelphians asking @TheRoots why we 'decided' to no longer participate in the 4th of July #WelcomeAmerica we all but resuscitated from cliche hell…this is past 'why fix something that isn't broken?'" Questlove added that festival organizers used "our talent, our resources, our contacts, our reach" and that "not for nothin but y'all thought it was the city who pulled in Kevin Hart to host?" In his posting, he included a video of Fox 29's Quincy Harris, who echoed Questlove's sentiments in an interview on the network. "Another thing about Wawa Welcome America that I did not like: I did not like that once Mayor Kenney came into office that the Roots were pulled from Wawa Welcome America," Harris said. "Now Philly is losing its SECOND annual festival — without warning," Questlove added on Instagram. "Who does that??" Mayor Kenney's office on Tuesday announced that 2018 would be the last year that Made in America would be held on the Parkway. Roc Nation, Jay-Z's entertainment company, told the Inquirer that the festival, which it presents alongside live nation, has no plans to leave the city. To date, Live Nation vice president of touring Omar Al-Joulani told the Inquirer, the festival has generated $100 million in direction spending since it started in 2012. "I'm absolutely hopeful that we can figure out a way to open up a dialogue with the city so we can be back on the Parkway in 2019," he said. Jay-Z was more pointed in an Inquirer op-ed in which he addressed the decision, writing that his is "disappointed that the mayor of the city of Philadelphia would evict us from the heart of the city." "We consider this stance a failure on the mayor's part. Is this an accurate representation of how he and his administration treat partners that economically benefit his city?" Jay-Z wrote. "Do they regularly reject minority-owned businesses that want to continue to thrive and grow alongside his city's people?" Mayor Kenney responded to Jay-Z on Wednesday, saying in a news conference that "we love" Made in America and "we want to keep it" in Philadelphia. Holding on the Parkway, however, has caused operational problems, he said. "We had some operational difficulties on the Parkway because of how long it takes to kind of set up and take down," Kenney said. Kenney added that it was noted in paperwork for the festival that 2018 would be Made in America's last year on the Parkway, but received no pushback from Roc Nation until now. His office, however, is "in conversations with the right people now." When asked if other Parkway events are at risk of being moved, Kenney did not say no, and noted that a recent study "talked about the stress of the infrastructure on the Parkway." However, Kenney left the possibility of a Parkway-based Made in America for 2019 open, saying that "I love Jay-Z." "The Parkway is very important to Jay," Roc Nation COO Desiree Perez told the Inquirer. "So I'm not sure that not having the Parkway will work."